This week Red Letter Days HQ played host to Willow (our nominated charity partner since 2010), when one of their number came into our offices to give a presentation to all staff. Read our interview with Hannah and get an update on the visit. Last year was a very busy one in our relationship with Willow, with lots of challenges fulfilled and money raised. We want to keep up the momentum in 2016 by continuing to be just as involved and we’er proud to partner such a worthy charity. Thanks for coming to visit us Hannah. Please tell what you do at Willow? I am the Major Partnerships Officer at the charity Willow. Willow is the only national charity working with seriously ill 16 to 40 year olds to fulfil uplifting and unforgettable Special Days. My role supporting our corporate partners varies hugely, from organising fundraising events to managing our corporate social media and attending networking events. I’m even happy to stand in the rain cheering on a corporate partner who has organised a charity football tournament! I love the variety of my role and no day is ever the same. I work across two offices and, although I am a hardy commuter, nothing quite beats the train blues like an email from a Special Day Beneficiary thanking Willow for their incredible day. I cannot help but feel instantly lifted. Can you tell us about Willow’s plans for 2016? For 2016 we plan to grow Special Days and aim to provide between 1,200 – 1,300 days. We want to increase awareness of Willow, particularly among medical professionals, leading to more Special Day applications. We also intend to expand our exciting fundraising programme, with repeat activities and new events. 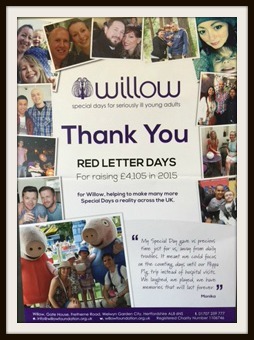 With Red Letter Days being long term partners of Willow, how did they help support the charity in 2015? Red Letter Days has been a proud partner for several years and last year raised over £4,105 for Special Days. Team RLD took part in the Hertfordshire 100, our 100 mile cycle challenge. Not to be outdone, more of the team took on Willow Warrior, our muddy, fun-filled, obstacle course. Staff showed off their creativity by inviting Great British Bake Off participant Ugne to switch roles and judge the staff’s tasty baked treats for The Great Red Letter Days Bake Off. Staff rifled through their unwanted goods and donated to our charity shops, including a very large and cuddly teddy bear! We’d also like to give a special mention to our ultimate Willow Warrior, Gemma Crozier, who took on a total of 10 gruelling challenges for Willow! To top all that, in April Red Letter Days held Willow Week, donating £1 from every red box experience sold. It even turned its website purple! In 2015 Willow delivered 1,029 Special Days and we simply could not have done that without supporters like Red Letter Days. And finally we’d like to ask if you could do any Red Letter Days experience Hannah, which one would it be and why? Although I do enjoy feeling pampered on a spa break, I have always loved watersports. It has been years since I went white water rafting so I would have to pick that experience. We hope you’ve enjoyed reading about Willow as much as we enjoy working with them. Check back for updates throughout the year to find out how we are supporting Willow. To learn more about their work or to get involved, visit their website.